After decades of relying on allies to furnish its armed forces’ material needs, the desert kingdom’s little known military-industrial sector is advancing faster than expected. 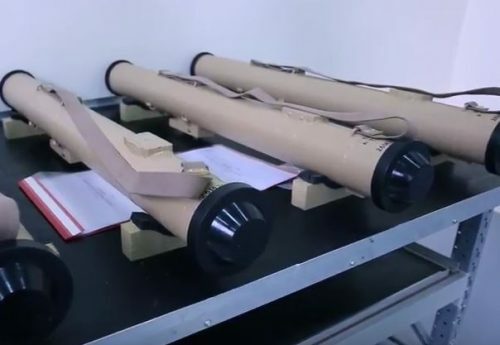 A recent breakthrough is a mysterious anti-tank missile called the “Terminator” from Jadara Equipment & Defence Systems, a manufacturing enterprise tucked inside the opaque structure of the sprawling King Abdullah Design and Development Bureau (KADDB). 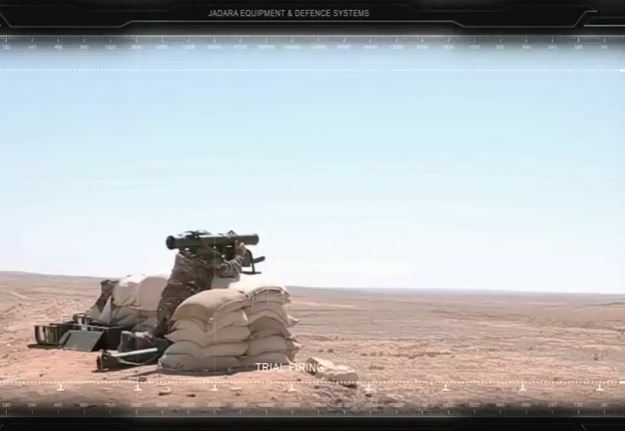 The Jadara Terminator looks like it’s the first locally made anti-tank missile from an Arab country, although Egypt’s state-owned factories have assembled British and Chinese missiles for decades. How did Jordan pull this one off? This is what the motor of the Terminator’s missile looks like before it’s attached to the warhead. Via Jadara/Youtube. Each Terminator missile is packed in a launch tube with a removable strap. Via Jadara/Youtube. 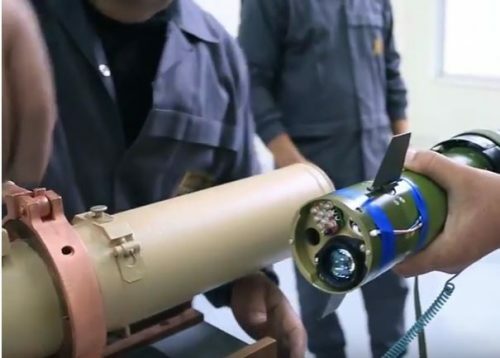 Jadara’s purview is assembling sighting devices and launch platforms for its sole anti-tank weapon, the RPG-32 Nashshab, which is licensed from Russia’s Bazalt. Although Jadara has a sniper rifle in its catalog, its facilities and staff are dedicated to larger armaments. The Nashshab is a short-range launcher for a 105mm PG-32V tandem high explosive munition. Far more powerful and accurate than an RPG-7, the Nashshab can also be reloaded by inserting a fresh rocket into its 6G40 launcher–an empty cylinder with a trigger assembly and a mount for the detachable thermal sight. This gives the Nashshab an edge over single use rockets such as the AT-4, the APILAS, and the LAW. 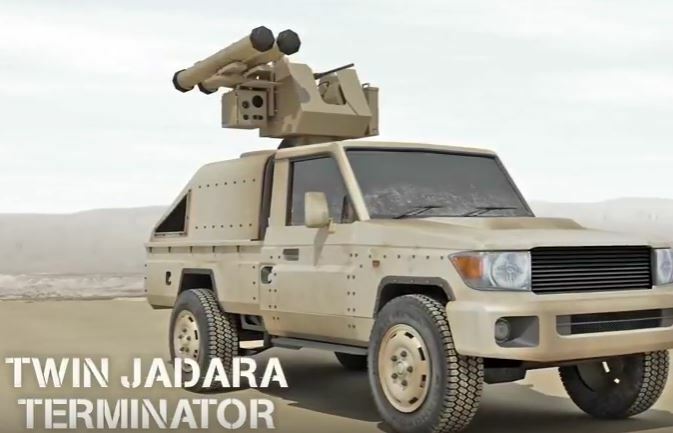 Jadara has already built a remote weapon armed with four Nashshab launchers that can be installed on different types of vehicles. Yet upon closer inspection, the Nashshab and the Terminator have little in common. Browsing through Jadara’s catalog gives little insight on the laser-guided missile’s origins and development. By the looks of it, however, the Terminator appears patterned after Russian anti-tank missiles such as the Konkurs and the Kornet. In fact, Jordan is reported to possess a stockpile of the latter. But a promotional video clip uploaded on Youtube earlier this year does reveal how the Terminator is assembled. The Terminator is meant to serve as a portable ATGM for defeating tanks and structures. 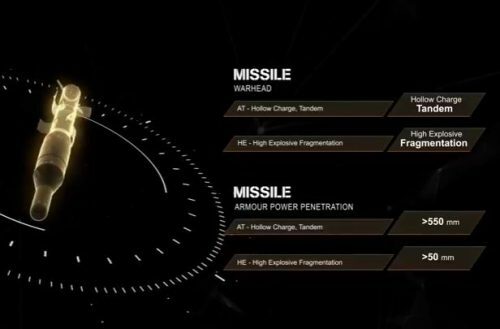 This is why its missiles come in either HEAT or HE configurations. Jadara’s manufacturing plant outside Amman designed and built all its parts, including a collapsible tripod, a launcher, a guidance unit, and the launch tube for the missile. 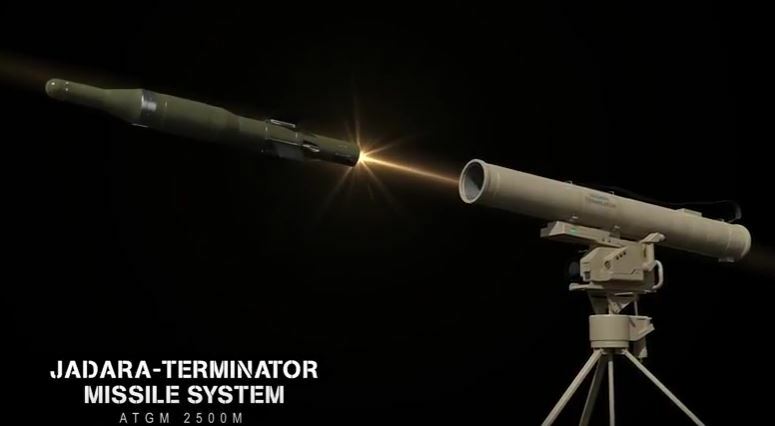 It turns out the Terminator is armed with a laser-guided 107mm missile that has a maximum range of 2,500 meters and armor penetration reaching 550mm. 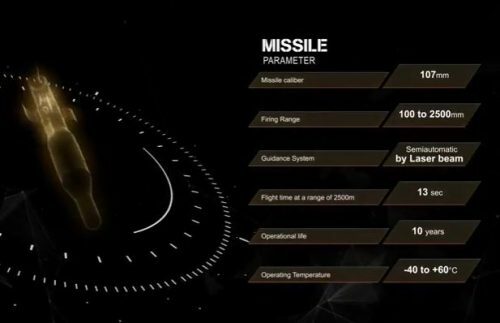 There aren’t any Russian missiles with these characteristics. The Terminator when assembled. The covers on either end of the launch tube are detachable. Via Jadara/Youtube. It turns out the Ukrainian Corsar was sent to Jordan for testing. Via Jadara/Youtube. Yet the Terminator’s shares a lot in common with a lightweight anti-tank missile made by Luch Design Bureau in Ukraine. The Korsar or Corsar was offered for export more than a decade ago but was never adopted by the Ukrainian military until its testing resumed in 2017 and it entered service soon after. One configuration of the Corsar has a collapsible tripod supporting both the guidance unit and the launch tube. The Corsar’s appearance and specifications suggests a transfer of technology between Luch and Jadara occurred in the last few years and this resulted in the Terminator. Indeed, video used by Jadara of a firing test for the Terminator’s missile shows the Corsar in its man-portable variant where it’s hoisted on the operator’s shoulder. During the SOFEX 2018 arms show Jadara even displayed a remote weapon station combining tandem missile launchers and an M2 Browning. This resembled another Luch product called the Sarmat that’s suited for the rigors of urban combat. 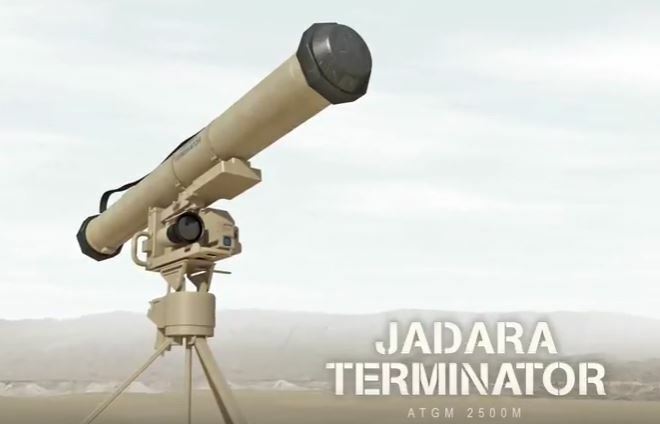 Jadara’s promotional media suggests the Terminator is now in production and will probably replace the army’s stocks of older US-made BGM-71 TOW and M47 Dragon anti-tank missiles. The Twin Jadara is best suited against light armored vehicles and structures. Via Jadara/Youtube. For Jordan to have locally made anti-tank missiles shows its military-industrial development is a lot more results driven than wealthier Arab neighbors like Kuwait, Saudi Arabia, and the UAE. Should additional FGM Javelin missiles for its army be too expensive or inaccessible, an alternative is developing a larger fire-and-forget missile for the Terminator. At this point, nothing is impossible.